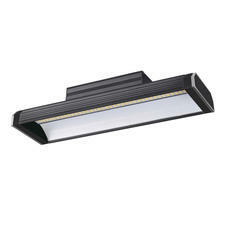 Decrease costs and improve safety with our range of industrial lighting here at First Lighting. Designed to provide powerful, long-lasting illumination, these lights are ideal for warehouses, high-bays, and low bays too. Not only will this wide range of industrial LED lighting be incredibly energy saving, but they’ll cost you less to run and replace too. Make the right choice for business and shop the expert lights we have on offer below. LED lighting might be the more expensive choice upfront, but thinking about it, in the long run, makes much more financial sense, as they’re cheaper to run and last much longer too. There are many more benefits to industrial LED lighting too, including safety and energy output. Health and safety are of vital importance to any job, especially the industrial sector, and with LED lighting you can guarantee a better quality of light, helping ensure that all corners are well light and no dark areas can be found. As well as this, LED bulbs give off 90% less heat than most incandescent bulbs, so not only will you get better lighting but you’ll increase the comfort for your workers, which will no doubt in turn boost productivity in the workplace too. For places of work where there are long hours, like the industrial sector, LED lighting is the perfect option, not just because they produce less heat, but they’re much more cost effective to run too. They typically have more than 25,000 hours of usage so you’ll not only save money on replacing the bulbs but the maintenance costs involved too. They’re beneficial to the carbon footprint of your business too, helping you go that little bit greener. Inefficient light bulbs are said to be slowly being phased out by the government, so there’s never been a better time to make the switch. If you’re looking for industrial lighting that will improve the safety of your business, as well as save your money on running costs and maintenance, First Lightings range of industrial LED lighting is the perfect answer. By installing these lights you can guarantee uniform lighting that will help to increase your employee’s productivity, make the most of your organisation today and make the change. If you need further assistance, don’t hesitate to get in touch with one of our experts who are on hand to provide advice.